During World War Two, York was surrounded by over 30 military airfields. Each base had over 1000 personnel – at RAF Elvington with two French squadrons there were over 2300 French airmen. With petrol rationing the only ways to get around were either to walk or by bike, so you can imagine the numbers of bicycles on the roads then – far more than even the huge peleton arriving in July. 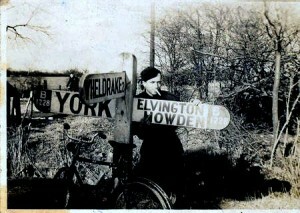 Airmen and soldiers on leave for the evening in York would grab any bike available to get back to base around the country lanes and especially if they were somewhat late in the morning, having partaken of one too many beers or found it difficult to leave their young lady! If they were late for roll-call they were put on a charge which could be quite severe or even posted as a deserter, which was a capital offence. As a result the ditches and lay-bys around York were littered with bicycles where they were often dumped in a hurry the previous night only to be readily retaken for someone else’s “night off in town”. 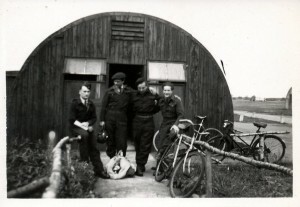 When France was liberated, the two French squadrons at Elvington prepared to return to there homeland and the first thing they did was to scour the immediate countryside for bikes. They collected hundreds and packed them all into the bomb-bays of their Halifax four-engined bombers ready for the trip back to Bordeaux on 20th October 1945. 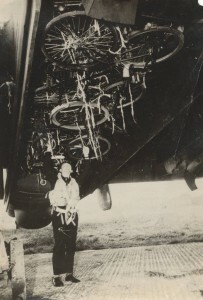 Even the servicemen came second to the bikes, as every available piece of cabin space was crammed. It is known that upon returning to France, a small number of French airmen actually rode these bikes back to their loved-ones in York – a distance of over 600 miles – such is love!